Whether shopping in St Helier is the main aim of your short break, or something to do when the weather isn't good enough for the beach, you'll find lots of info here. map of St Helier if you don't know the town. Click on the link on the right where it says St Helier street map. Then click right in the centre of the map to enlarge it. The pedestrianised areas are shown in purple. The main pedestrianised area stretches the length of King St and Queen St. There are many of the well-known high-street shops in St Helier, and some of the names you will recognise along here include Mothercare, WH Smith, Marks and Spencer, JD Sports, Top Man and Top Shop, Jessops, HMV, Millets, Clarks Shoes, Accessorise, BHS, Evans, Woolworths, Thorntons Chocolates, Burton, Next, and Boots (one small and one large shop). Local shops along here include Amy's, a traditional men's outfitter; Maison La Mare (say 'may-zon luh mar') which sells Genuine Jersey products; Pearce Jewellers, Beghin's (say beg-anns) shoe shop and Hamon's. Maison La Mare is a favourite place for people shopping in St Helier for high-quality, locally made products to take home for gifts. Hamon's is something of a time-warp, and worth visiting for a reminder of how shops looked about 50-60 years ago! They sell curtain fabrics and fittings, household textiles, haberdashery and rather old-fashioned women's underwear and nightwear. Another shop in St Helier worth visiting for the time-warp factor is the small shop in one corner of the Central Market called Red Triangle Stores. A combination of luggage, model making gear and an amazing range of household items and tools squeezed into a tiny shop with the original wooden shelving. You'll find the two main Jersey department stores, De Gruchy's (say 'der grooshies') and Voisins (say 'voyzins')in King St. Both stock well-known, high-quality brands of clothing and kitchenware, among other things. The pedestrianised area also extends along parts of Don St, Halkett St, Halkett Place and Bath St. In Don St you will find a toyshop, a bathroom accessory shop, a flower shop, a cycle shop, and if you walk further down you will come to the Co-op Homemaker store. Along Halkett Place you'll find the Jersey Pottery shop, Tube Sports, Hallmark Cards, a pet shop, and the Euronics Centre. If you continue even further down you will come to the popular Bean Around the World coffee shop and the Jersey Library. There are also a variety of restaurants along Halkett Place. If this is your first time shopping in St Helier, don't miss going into the Central Market. The displays of cut flowers, fruit and veg are worth a visit even if you're not buying. It's easy to get confused by the names of Halkett Place and Halkett St. Halkett Place is a busy road which crosses the main pedestrian area between Burton's and Amy's. Halkett St is a smaller pedestrianised street which starts next to the larger Boots store in Queen St. In Halkett St you will find several menswear shops, jewellers, Axle Woman and Principles, MacDonalds, and a small specialist collectors shop, Jersey Coin Co Ltd. You will also find one of the entrances to a small department store called the Arcade, which houses Leader's Health Food store. 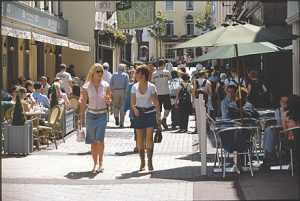 If you're planning to go shopping in St Helier, why not have lunch while you're there? There are many places to eat ranging from take-away sandwich bars and cafés to restaurants of all types. Look out for the Jersey Pottery Cafés (Bond St and King St) and Mange Tout (Colomberie, New St and Sand St)if you want something quick to take away with you. There are seats in the Royal Square - it's a favorite place to sit and have lunch. West Centre also has seating. Howard Davis Park is a few minutes walk from one end of the shopping precinct, and Parade gardens a few minutes walk from the other. The other side of the large Boots store in Queen St you will find Bath St. Walking down Bath St you will see some more menswear shops, gift shops, Ann Summers, Murphy's and Axle. There is an open square (West's Cente) with a bronze sculpture of some Jersey cows. If you continue on along Bath St after the pedestrian area ends, you will find a party shop, a Checkers supermarket (well hidden - look for the baskets in the entrance on your left), Le Gallais (another Jersey department store specialising in household furnishings, and Island Music - one of the main shops selling musical instruments in Jersey. Even further along on the right, after RBS, is a shop selling mainly outdoor clothing and camping equipment. Beresford St runs between Bath St and Halkett place. The fish market is along here. Most of the banks and cashpoints are near the junction of New Cut Library Place and Broad St. If you're walking along King St look for Rivoli Jewellers and Hamons. The cashpoints are close. If you're shopping in St Helier and looking for real bargains, don't forget to check out the many antique dealers and second-hand shops. Find out more about the Central Market. Fun things to do to keep young children happy while you're shopping in St Helier. Return to Shopping in Jersey. Return to the top of Shopping in St Helier.